After months of speculation, the first trailer for Captain Marvel has officially arrived and it's just as awesome as everybody was hoping it would be. Marvel Cinematic Universe devotees have been waiting to see footage from the film ever since the first pictures of Brie Larson in costume started to find their way online earlier this year. The promotional campaign for the movie started this month when a bunch of official still pictures from the movie were released, giving fans their best view yet at Carol Danvers, young Nick Fury, Mar-Vell, as well as the shape-shifting Skrulls. Carol Danvers is the most powerful character to be shown from the MCU thus far, according to Marvel Studios boss Kevin Feige, which has led to some speculation as to how Captain Marvel will fit into the rest of the MCU, especially after Nick Fury contacted her before turning to dust at the end of Infinity War. The upcoming film takes place in the early 1990s and features a previously unseen era of the MCU, which is really exciting for fans that have been with the studio for the last decade. The Carol Danvers standalone movie has been in development since 2013, but wasn't officially announced until the summer 2016. Captain Marvel is not a traditional origin story, and begins with Carol Danvers already in possession of her powers. However, the film will show Danvers learning to harness her powers, according to Jude Law. In the comics, Danvers is an Air Force pilot who gained her abilities when her DNA was fused with that of an alien species during an explosion. She becomes one of the most powerful heroes in the universe as a result of the explosion and is thrust into battle as Earth is caught in the middle of a galactic war between two alien races. The young Nick Fury meets Carol Danvers in Captain Marvel at a time before he was the S.H.I.E.L.D. badass that we know today. It's Danvers who opens Fury's eyes about super powers and alien races, and he'll be on hand to help her on her mission against the shape-shifting Skrulls. Kevin Feige wanted to take Nick Fury and bring in the same feeling that the MCU started with the first meeting of Fury and Tony Stark, when he tells Iron Man that he's a part of "a big universe. You just don't know yet." Now that the first trailer is officially out in the wild, it's only a matter of time before MCU fans start to wonder about Captain Marvel's Avengers 4, as well as the official title for said movie. However, the footage looks pretty awesome and stands on its own, while appearing to also be a worthy competitor to go up against the DCEU's Wonder Woman, which beat the MCU to the punch for the first female-led standalone film. 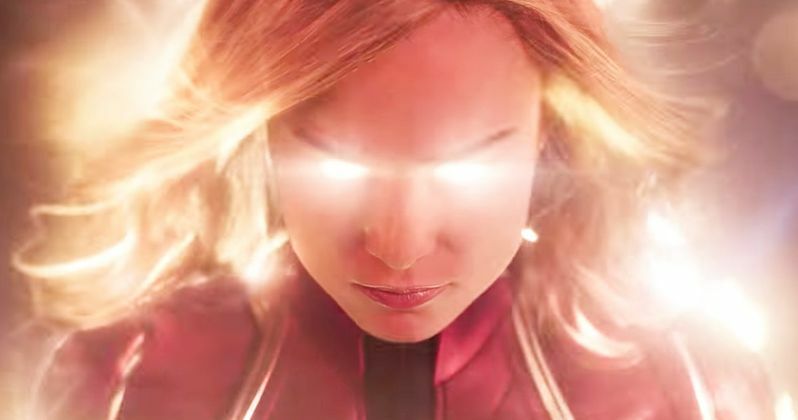 Captain Marvel hits theaters on March 8th, 2019, and you can check out the brand-new trailer below, thanks to Marvel.